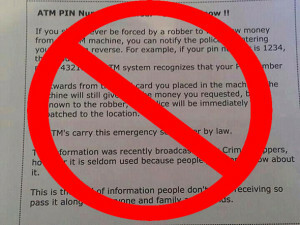 Message claims that if you are forced by robbers to withdraw money from an ATM, you can secretly alert police by entering your PIN in The claims in the message are false. Reverse PIN technology does exist. However, it has not yet been implemented by any banks. At this time, entering your PIN in reverse will NOT call police. reverse. This entry was posted in MisInformation, Web Hoaxes. Bookmark the permalink.